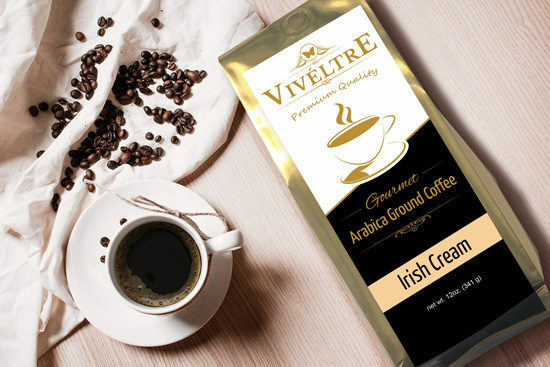 Viveltre’s gourmet flavored coffee line carries pairings for many of our gourmet marshmallows, such as Irish Cream which is a consistent favorite amongst customers. Irish Cream is traditionally a blend of whiskey, coffee, cream and sugar. This remarkable mixture has been captured in our light roast Irish Cream. Enjoy the buttery blend of Irish Whiskey and cream flavors, with aromatic almond and hazelnut notes. Bring a little Irish into your coffee brewing experience! Viveltre’s gourmet flavored coffees are proud to use green coffee roasters in order to reduce our carbon foot print. Viveltre coffee is brewed locally in small batches. Viveltre uses 100% Arabica beans in a light roast to let the flavor profiles shine.